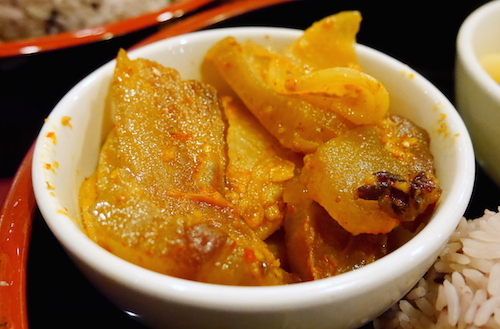 Over the course of 2014, I became interested in the Bhutanese national dish named ema datsi, a simple combination of chili peppers and cheese. 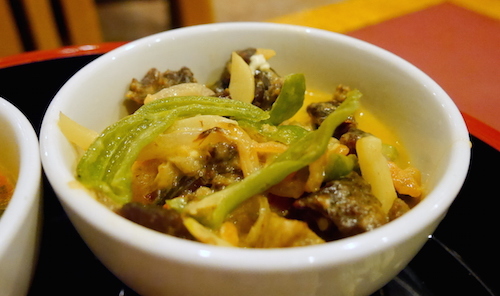 In Dzongkha, Ema means chili, datsi means cheese. 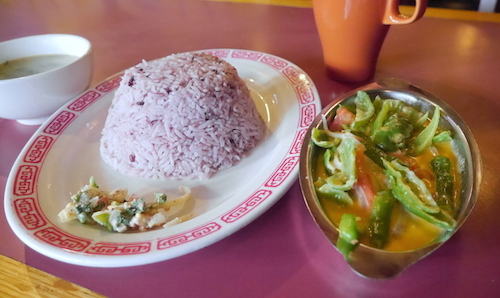 The difference between what it seems like and what it feels like is the way every bite explodes in your mouth, as this dish is not supposed to be eaten unless it makes you sweat. I searched at a couple Himalayan restaurants in the area to find it, with varying results. One oddball restaurant even has a Bhutanese chef that put it in the "exotic" portion of the menu. 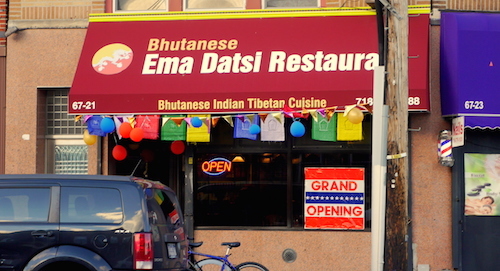 With winter setting in, a Bhutanese restaurant has opened in city for the first time, with their national dish right on the awning. There are a couple pages of Himalayan and Indian food to round out the menu, but a full page of Bhutanese dishes is very exciting to find. The setting is a comfortable but bare bones dining room, with an informative English language guide to Bhutan on the TV. On both visits I made, the place had a good crowd for its first week in business, even in the middle of the afternoon on a weekday. On my first visit, I was alone and went straight for the namesake. They prepare ema datsi ($7.99, above and below) with plenty of peppers, and a large side of red rice, the rice eaten in Bhutan. It is fluffy and slightly sticky, and gets its red color from some of the unmilled bran left in the semi-milled rice. The cheese is from yak, or is supposed to be, and is thinner here than other versions I have sampled. They did ask me "mild or spicy?" and even though I asked for spicy, I believe they did not add the full heat. 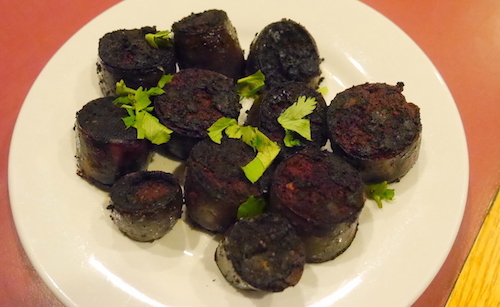 On a second visit I brought company and we started with the appetizer our waitress recommended called gyuma ($8.99, above and below), a Tibetan sausage that is filled with tsampa, a roasted flour that has the texture of pillowy bread. The sausages are blackened during cooking, and we found the pieces very dry. The accompanying spicy cold vegetables add some good taste to them, but in the risk of saying something sacrilegious, it needs sauce. Most of the Bhutanese items on the menu come with no explanation under a name, so we had our waitress go through each item for us and selected two thalis to get a good assortment. The sha kam datsi thali ($10.99, below) has one familiar word in it (datsi = cheese), which is combined with a dried beef in this case, as well as peppers and onions. On the thali is another mound of red rice and a bowl of potatoes in sauce (which I started using with the sausages). Both the potatoes and beef go very well with spoonfuls of rice. 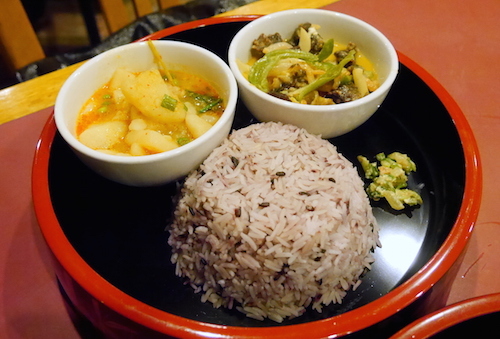 What I do ascertain from this dish as well as the ema datsi, is that I am very happy when Bhutanese yak cheese dishes are presented to me. Our second plate was the sekam thali ($10.99, below), which came with the main meat of dried pork. This pork is very fatty, but also very delicious as well and reads as a thick bacon to the less initiated like myself. This dish is not spicy at all and too be honest, disappears far too fast from the little bowl. 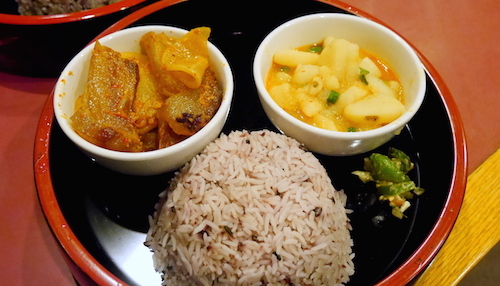 Bhutanese thalis seem to be less centered around vegetables than their south Asian counterparts, so on further visits I might consider getting an appetizer that had more green in it to balance the tastes. All the main dishes ordered on the two visits included a very light, barely spiced soup with greens inside. I also got a cup of sweet tea ($1), which is indeed quite sweet but very satisfying with the other salty tastes involved in the cuisine.